Understanding he best ways to protect your home, family, and business from fire should always be at the top of your to-do list. In fact, from selecting smoke detectors, carbon monoxide alarms, and fire extinguishers, knowing the critical elements becomes integral to a safe home and building. Here is a helpful fire safety guide for choosing the best smoke alarms so that you can ensure the safety of you home. Smoke alarms are one of the best and least expensive ways to provide an early warning signal when a fire first starts. In fact, when properly installed and maintained, smoke alarms can instantly help to prevent injuries and substantially minimize property damage. As a result, a smoke detector can really be the difference between life and death. Photoelectric: These types of fire alarms can detect any visible fire particles which are traditionally associated with large-scale, smoldering fire quicker than the ionization fire alarms. Installing smoke alarms is a perfect way to practice fire safety. In fact, installing a fire alarm on every floor of your home ensures that you protect yourself, your wonderful family, and your precious home from any potential fire. A lot of people don’t appreciate fire safety, especially in the hallways of their homes. However, this is a crucial place where fire alarms should be placed. 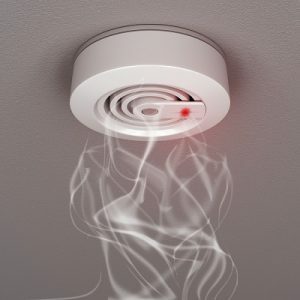 On average, homeowners have less than three minutes from the time the first smoke alarm sounds to escape from a fire. The sooner that you are able to hear a fire alarm, the more time you are able to give your family to escape. This entry was posted on Friday, March 23rd, 2018 at 3:23 pm. Both comments and pings are currently closed.